All of these predatory mites live and feed in the soil as generalist predators. They target a variety of prey such as thrips pupae, fungus gnat and shorefly larvae and springtails. Until about 20051,2 these species were sold as either Hypoaspis miles or aculeifer. However, following a review of the taxonomy of these mites, the genus Hypoaspis was deemed incorrect for these mite species. H. miles was re-categorized as Stratiolaelaps scimitus; H. aculeifer was re-categorized as Gaeolaelaps aculeifer; and a new species was described, Gaeolaelaps gillespiei. The original genus name of Hypoaspis may still be used occasionally, though this is incorrect. Because these mites can survive on a variety of prey sources, they can persist in the growing medium for many weeks even in the absence of pest prey such as thrips or fungus gnats. All three mites are similar in appearance and habit (figure 1). The adults have 8 legs, are about 0.4 mm long and tan coloured. The eggs are laid in the growing medium and are unlikely to be seen. The larvae (youngest immature stage) have 6 legs, and are much smaller and paler in colour than the adult. The later immature stages (the protonymph and deutonymph) have 8 legs. • All these mites have 5 developmental stages: egg, larva, protonymph, deutonymphs and adult. • S. scimitus is able to survive and develop in the greenhouse at temperatures from 15-30°C; the optimal temperature for this predator is 25°C1. • Development time of S. scimitus is 10 days at 30° C, but can take up to 46 days at 15°C1. At 25°C, females lay 2-3 eggs per day. S. scimitus is relatively long lived, and survives up to 142 days with food2. Optimal temperatures and development times for the other mite species are similar. • All these mites will attack all larval stages of fungus gnat larvae, as well as thrips larvae and pupae; eggs of pest species are generally not attacked2. • G. aculeifer (and possibly G. gillespiei) generally have higher predation rates (3-4 thrips/d, 1-4 fungus gnat larvae/d) than S. scimitus (1-2 thrips/d)3,4. Each of these mites is sold in bulk in a carrier mix of peat and vermiculite. Package sizes contain from 10,000 to 125,000 predatory mites. Refer to the Grower Guide: quality assurance of biocontrol products to assess the quality of the mites at receipt at the greenhouse. All of the mites persist well in the growing medium of the crop, and generally only need to be applied once for a short-term crop. Mites can be distributed manually soon after planting, or even on the planting line, before the crop is planted. The product should be thoroughly mixed before distributing, and can then be spread by hand. While every effort should be made to distribute the product evenly through the crop, it is not as critical as it is with foliar predatory mites. Recommended introduction rates for these mites are usually about 100/m2 at the beginning of the crop cycle. Environment is not as important a consideration as it is for many foliar dwelling BCAs. Humidity is usually much higher and maintained more evenly in the soil. Diapause is likewise not usually relevant with soil-dwelling organisms. 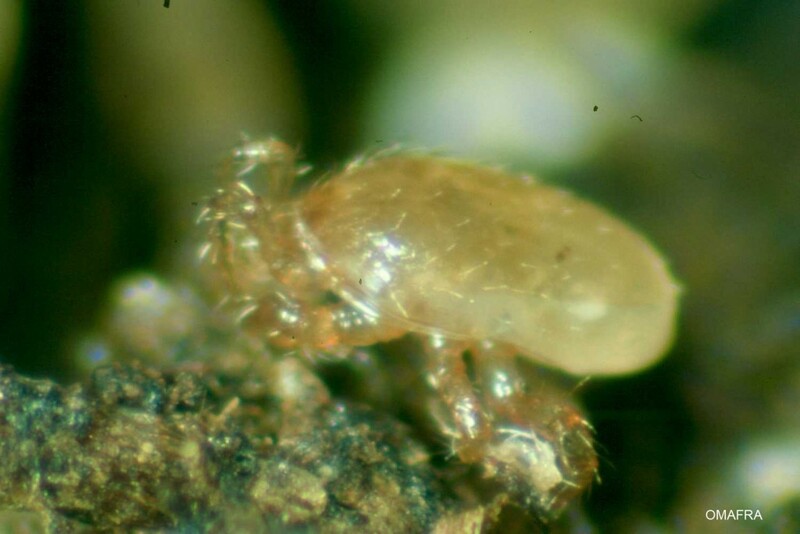 The soil-dwelling mites are not affected by day length, and although cold temperatures will cause them to become inactive, they do not enter diapause. Monitoring for S. scimitus, G. gillespiei and G. aculeifer can be difficult. Mites can be detected by close inspection of the surface of the growing medium or the crown of some plants such as cyclamen. Monitoring tools for pests such as fungus gnat larvae can also be useful for detecting these predators. Although mainly a research tool, some growers have used potato discs which are placed on the surface of the growing medium. When removed after 1-2 days, fungus gnat larvae and their predators, such as mites and rove beetles, are typically found on the underside of the disc. In vegetable crops, thrips drop to the ground to pupate when RH at the plant level is lower than 80%5. 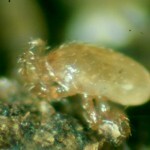 In such cases, thrips pupae may be found on the ground cover, in/on the rockwool cubes or on the surface of the slabs. Research has demonstrated that soil-dwelling mites provide some control of thrips in hydroponically grown crops6, though mites are likely less effective here than in crops grown in potting media. These predatory mites are not usually used in conjunction with each other but can be (and often are) used with other BCAs such as Dalotia and microbial products such as Metarhizium anisopliae (Met52). Interactions among different soil-dwelling BCAs do occur7,8 but are not thought to have a significant impact on control efficacy at the large rates of release seen in commercial greenhouse crops. Recently, large commercial shipments of aculeifer are becoming hard to acquire from biological suppliers, forcing growers to rely more on S. scimitus. Insecticide and fungicide drenches are often compatible with soil-dwelling predatory mites. Ydergaard, S., Enkegaard, A., and Brodsgaard, H.F. 1997. The predatory mite Hypoaspis miles: temperature dependent life table characterisitcs on a diet of sciarid larvae, Bradysia pauper and B. trictici. Entomologia Experimentalis et Applicata 85: 177-187. Wright, E.M. and Chambers, R.J. 1994. The biology of the predatory mite Hypoaspis miles (Acari: Laelapidae), a potential biological control agent of Bradysia pauper (Dipt: Sciaridae). Entomophaga 39: 225-235. Vanninen, I., Koskula, H. 2004. Biocontrol of the shore fly Scatella tenuicosta with Hypoaspis miles and H. aculeifer in peat pots. BioControl 49: 137-152. Berndt, O., Poehling, H-M., and Meyhofer, R. 2004. Predation capacity of two predatory laelapid mites on soil-dwelling thrips stages. Entomologia Experimentalis et Applicata 112: 107-115. Steiner, M. Y., Spohr, L. J., Goodwin, S. 2010: Relative humidity controls pupation success and dropping behaviour of western flower thrips, Frankliniella occidentalis (Pergande) (Thysanoptera: Thripidae). Australian Journal of Entomology. Gillespie, D.R. and Quiring, D.MJ. 1990. Biological control of fungus gnats, Bradysia spp. (Diptera: Sciaridae), and western flower thrips, Frankliniella occidentlis (Pergande) (Thysanoptera: Thripdidae), in greenhouses using a soil-dwelling predatory mite, Geolaelaps sp. nr. Aculeifer (Canestrini) (Acari: Laelapidae). The Canadian Entomologist 122: 975-983. Jandricic S., Scott-Dupree C.D., Broadbent A.B., Harris C.R., Murphy G. 2006. Compatibility of Atheta coriaria with other biological control agents and reduced-risk pesticides used in greenhouse floriculture IPM programs for fungus gnats. The Canadian Entomologist 138: 712-722. Pochubay, E.A., Grieshop, M.J. 2012. Intraguild predation of Neoseiulus cucumeris by Stratiolaelaps miles and Atheta coriaria in greenhouse open rearing systems. Biological Control 63: 195-200.